Another quiet day on the nest today! We did have a nice,quiet day on the MN Bound nest today! But before we get to that I would like to announce that we have 2 new additions to the Eagle world! The NCTC nest at Shepardstown, W.Va. had their first hatch of the year. I saw the little fella on video but was unable to get a good capture of him. 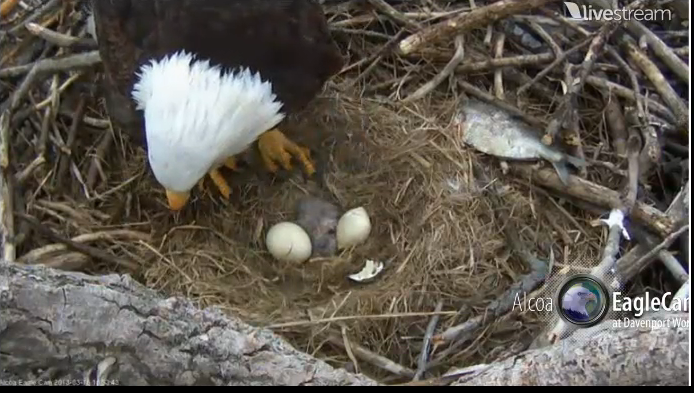 The other addition to the nest population was at the Alcoa Eagle Cam in Davenport, IA. Liberty(mom) and Justice(dad) welcomed their first of the season also. I did get a couple of shots from there. Thanks to Eagle411 for the second pic! Welcome to these 2 newest nestizens! On our nest today it dawned to a wonderful Neo-Spring day in Central Minnesota. It was a little colder than the last few days and seemed like the calm before the storm that is coming tomorrow. Mom and Dad exchanged places several times and had a relaxing morning. Dad did give us another eagle singing lesson this morning, maybe he was loosening up for St. Patricks Day?? Dad did have a small OSD attack and mom showed us her wings a little later. Unusually Mom and Dad left the eggs all alone for short periods today. Chatters immediately became concerned but the eggs were well behaved and didn’t cause any trouble while their parents were away! Toward the sunset a couple of our wonderful mods got some great pics of the Kirby rays from the new cam. Thanks to all who contributed pics to the blog today and thanks especially to BroadBand Corp for the Cam. So, all in all another marvelous Eagle day at the MN Bound nest! Happy Eagle viewing and we’ll see you on the nest!